From flying DeLoreans to secret agent Aston Martins, these are the car moments in film that everyone knows, that are ingrained into our collective unconscious. Oh, and when we asked you all to give us suggestions for this top ten, we got the ball rolling with Bullitt. So consider that chase scene (particularly the Charger and Mustang jumping over the hills of SF) as an honorary #11. There really are three iconic car moments in Back to the Future — the last one is when the DeLorean takes off to the immortal words "where we're going, we don't need roads." The second is when the DeLorean hits 88 miles an hour and leaves tire tracks in flames. 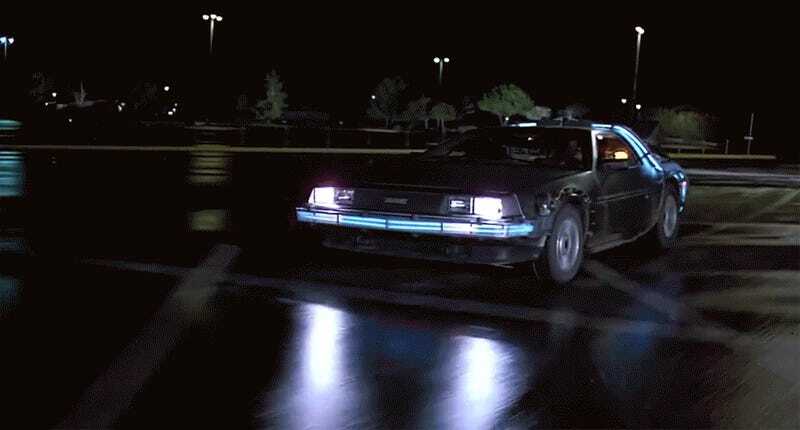 The one that sets up the whole movie is the first moment, though, is when Doc Brown says "The way I see it, if you're gonna build a time machine into a car, why not do it with some style?" And the DeLorean rolls out of the trailer like some kind of modern Frankenstein's monster. Cheesy as it may be, everyone, and I mean everyone, knows Chitty Chitty Bang Bang. This is the car moment for the newest generation, the standout scene of the standout car movie for today's kids. Just like Lightning McQueen and Doc Hudson established cars for the youngest watchers, the young/old relationship for cars was explained to the last batch of kids in the ultimate drag racing scene in the Fast and the Furious. When the Charger leaps up on two wheels, a whole generation watched. This is the moment that launched a thousand bone-crushing copycat jumps across the South. It's been repeated everywhere from Dukes of Hazzard to Speed, but more than that it stood for a moment of 1970s Southern revival in American culture as a whole. It's not that this was just a defining moment for car culture — this scene where two sets of kids talk from car to car down main street cemented a vision of America (or Americana) that you can find across the globe. In any big city in the world, you'll find at least one American-themed restaurant serving hamburgers and malts, and you'll see a picture of these cars on the wall. You could argue that there are three iconic moments with the legendary Ferris Bueller's Day Off Ferrari (even though it was really an MG). You could say there's the moment when he picks up the girl outside school, a trope that's been repeated a million times. You could say it's the jump during the valet's joyride. But the best moment is when everything comes tumbling down, and when the Ferrari rolls right out the wide glass window. The world cringed when that Ferrari fell. I'm not going to say that the whole rebel spirit of the '60s comes down to these little Minis pulling off a massive gold heist in old Italy, but it certainly captured the spirit as well as anything else did. The introduction of the Bond Car, a trope that's been repeated time and time again not just in Bond movies, but in heist movies, spy movies, and just about everywhere else that gadgets play a role.